SDG 3 : HEALTH AND WELL BEING FOR ALL ! “Pregnant woman, one foot in the tomb.” (« Grosse Femme, un pied dans la fosse »). While this expression no longer seems to make sense in so-called developed countries, it unfortunately remains relevant in some parts of the world. Indeed, many regions still face serious health risks. While child mortality under-five years old has declined overall, the proportion of deaths is increasing in sub-Saharan Africa and South Asia: 4 out of 5 children who die under five-year old are from these regions. Significant progress has been made in increasing life expectancy and reducing the major causes of child and maternal mortality, but many additional efforts are needed to achieve the targets set by 2030. Because for a more equitable and sustainable society, it is essential to enable everyone to live healthy lives and promote well-being at all age, this year health was at the heart of the Convergences World Forum. Experts gathered at the 11th edition to provide their solutions and highlight innovations for health today and tomorrow. What issues for the tomorrow’s health? How to innovate for the health of tomorrow? Then, what are the key steps to ensure the success of these health innovations? What funding for the tomorrow finance? In terms of health, there are many inequalities between developed and developing countries, due to a lack of resources or staff, the inaccessibility of advanced medical innovations, malnutrition and education problems. However, health impacts everyone’s well-being. Knowing the needs (data and medical follow-up of patients), having the physical means to access populations and provide them with the necessary medical assistance (cold chain), overcoming cultural barriers and acceptance of treatments, these are some of the points that hinder access to health for all. The case of Philippine and his 7000 islands is an example of the health issues in developing countries. The country has doubled his population in about 20 years and with only one doctor for every 30,000 people and a lack of digitalisation, the infrastructure is not adequate. Rural populations are particularly concerned by the issue of accessibility. In Africa there are less than 3 doctors per 10,000 inhabitants and only, on average, one health center 8 km away, 80% of the population has a mobile phone. So how can we capitalize on this technology to improve access to health for all? Digital technology can reduce this distance at a lower cost, but e-health raises the question of data security. A pilot remote diagnostic project in Botswana has been abandoned because innovation there has been no ethical safeguards to secure access to data. It is therefore essential to support developing countries so that they can make informed decisions on the protection of their health and other data. The way of life and the way population evolve have also become major health issues for the future. Nutrition must be an integral part of the health approach. Health is thus a challenge at the crossroads of human, industrial and environmental dimensions, and the scope of its challenges extends to all these dimensions. It is therefore a question of informing consumers as well as possible about what they are buying, in order to empower them, for example by displaying the carbon impact of a product. This display would also make it possible, at the end of the chain, to make manufacturers more responsible. Ideally, negative environmental and social externalities would be integrated into the product price, to encourage the consumption of healthy and responsible products. In France, we can also count on the role of local authorities in social ecology by providing land for food aid, for example. The food has an environmental cost, social cost and a cost on our health. Be careful to not neglect the new types of pandemics for which we must prepare, such as diabetes, since in some countries Coca is cheaper than water, while 2.1 billion people do not have access to drinking water, or three in ten people in the world. The Ministry of Europe and Foreign Affairs (MEAE), through its Secretary of State, presented the French innovation strategy for access to health for all. For Jean Baptiste Lemoyne, the Government is there to create the conditions that allow actors to act and innovate. There is no innovation without trial and error, he told us. And for this purpose it is necessary to consolidate innovative financing such as the MUSKOKA Fund (see next section). Beyond funding, it is necessary to succeed to demonstrate pedagogy and use education through entertainment and cross-media strategies, in a context where the use of new information and communication technologies (NICTs) is expanding, to change behaviour, particularly on subjects that are at the heart of the French strategy such as health, gender equality or the elimination of gender-based violence. To involve the local population, awareness-raising work must be carried out and local trainers involved. We must localize solutions to fit the needs of the local communities. To establish the sustainability of an innovation, it is necessary to involve the population that knows the problems of the community according to a bottom-up approach. To strengthen or develop access to health for all, innovative projects are not lacking and vary greatly: accessible and affordable health systems, patient empowerment, sustainable cost technology… This is why these innovations for inclusive health are struggling to find a common name despite their concrete contributions: lowering the costs of health systems and increasing their performance. In 2014, to control Ebola in West Africa, for example, Google Maps was used to locate diseases and stop the spread of the disease. Vaccines don’t deliver themselves, so we have to make sure every child gets a vaccine and so we have to innovate for health. In Rwanda we had to use drones for instance. Anywhere in Rwanda you can have blood delivered in 20 minutes. On the other hand, despite the relevance of an idea (using mobile phones to reduce the distance between health centres and patients, for example), the conditions must be in place to ensure the success of these innovations. It is first necessary to distinguish between the innovative tool and the purpose: the intrinsic objective of any innovation must always be either to improve or maintain the health of populations and to improve the quality, efficiency and safety of care and services. In addition, the obstacles that these innovations face in their implementation and change of scale are many: difficulty in penetrating the environment, the need to develop complementary skills, collaboration between doctors and digital experts who do not share a common language, lack of partnerships with public institutions, etc. In order to innovate for the tomorrow’s health, it is necessary to have the support of all the actors – small or large – by mobilizing them in particular to meet specific and concrete needs such as the level of the hospital’s bandwidth. Interdisciplinary meetings must be encouraged to create frameworks conducive to the emergence of new ideas and to facilitate collaboration between the various actors. Most of health issues do not come from the health. Through the computer graphics presented at the Forum, the Convergences Working Group on Health and Innovations tentatively gathered the main steps through which a health innovation must go through to be and remain effective. These steps can be carried out simultaneously and function in a circular way, i.e. they are enriched by each other. Innovating in health is therefore a more organic than mechanical process. It should be noted that accessibility is a transversal theme at these different stages. It is based on 3 axes: price (affordability), use (for beneficiaries), and use (by practitioners). 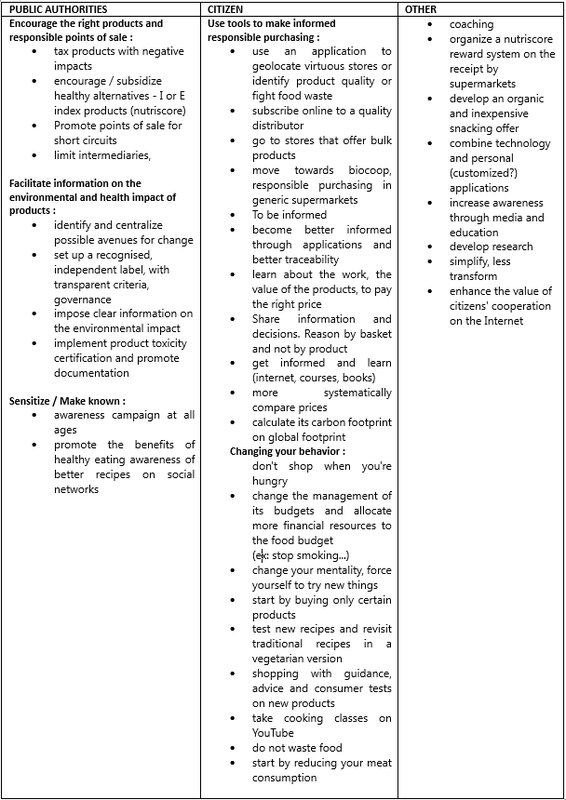 These steps will be enriched by concrete examples (see p. 2) provided by the members of the Convergences Working Group. Convergence thanks the structures that helped it to prepare this document : Amundi Asset Management, AP-HP, Croix Rouge Française, Crédit Agricole SA, echOpen, FAMOCO, Fondation Pierre Fabre, Fondation Sanofi Espoir, La Paillasse, Nantucket Capital, Sanofi, Solthis. When there is data that you trust, everybody is very motivated and knows they are working in the same direction. Many people in both developing and developed countries give up care or postpone it due to the lack of adequate and accessible care structures or the lack of financial resources to access it. States, local authorities, NGOs, or investment funds, there are many actors in health financing. While health funding increased between 2000 and 2010, it has since decreased. Indeed, financing is becoming more and more difficult to obtain. Donors require very specific monitoring and data, which causes a lot of pressure. In addition, corporate foundations no longer finance projects but wish to implement them themselves. The main donors in the health sector are the United States (mainly for AIDS), the Bill and Melinda Gates Foundation (mainly for infectious disease) and France through the French Delopment Agency (AFD). Therefore, how can the different investment mechanisms be articulated to finance an area such as health, which often promises only a low return on investment from a financial point of view? First, stakeholders agree that partnerships should be fostered, through the sharing of quality information and the creation of a circle of experts to judge it. Connections must be made to find out where the others stand and avoid unnecessary duplication. The public-private partnership model has made it possible to capitalize on the sum of the comparative advantages of their partners and the business model to accelerate access to vaccines and ensure sustainable financing. Other partnerships in kind can be set up. Secondly, in terms of financing mechanisms, microfinance, often presented as a miracle development tool, is not well suited to financing access to health, because of its cost and its own functions. In this field, it is necessary to prefer impact investing (or hybrid finance, thematic investment funds, inclusive insurance). Another way to finance the health of tomorrow is to help large companies think about their social impacts, by developing social impact contracts. Other solutions make it possible to make a model sustainable according to the social enterprise model. Beyond funding mechanisms, models of health profitability must be explored. Indeed, it appears that investments in the health sector often have an economic (and not financial) return that can be observed in the short term. Thus, the training of midwives in a developing country reduces infant mortality and complications for women who give birth, thus having an impact on the development of the whole society. But if the health supply has a viable economic model, it is often more complicated to raise the necessary funds to repay the initial investment. It is then necessary to set up a health system that is both very cheap – and therefore very accessible – while being sufficiently profitable to be able to attract investors. These issues of profitability and solvency of health projects, as intrinsic conditions for their financing by third parties, necessarily lead us to think and invest in innovative business models that are capable of being “profitable” both to be self-financing and to repay initial investors. It is also necessary to support the emergence of indicators and measurement tools adapted to health projects, to take into account their global impact on other areas of development. The tool developed by the Convergence Working Group – Health Financing – and presented at the Forum aims to describe the financial and extra-financial circuits that health projects follow, from their financing to returns on investment and including certain virtuous economic models. 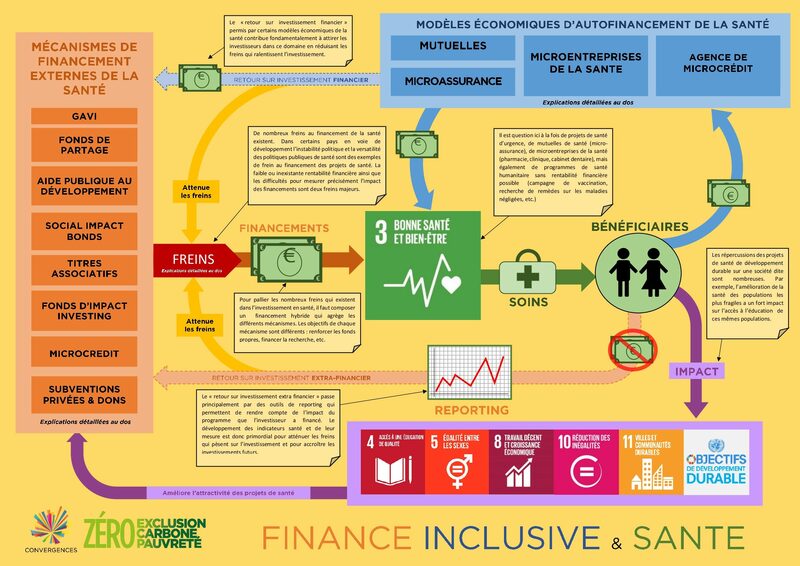 This infographics gathers the different discussions and analyses held by the members of our “Inclusive Finance and Health” working group. Convergence thanks the structures that helped it to prepare this document: 1001 Fontaines, AMP Avocats, B&L Evolution, Crédit Agricole, Crédit Coopératif, ECOFI, e-MFP, Green Innovation, HEC, Nantucket Capital, OXUS, Solthis, Yunus Center. The “C’est-la-Vie” series, supported by the MEAE (French MoFA), aims, through entertainment and fiction, to raise awareness among the population, and in particular among teenagers and young people, about maternal and child, sexual and reproductive health, to denounce gender-based violence, to promote the fundamental rights of women and adolescent girls to health and education and to promote their empowerment. The innovation of the series, which has been broadcast throughout the African subcontinent since 2016, with 20 million cumulative viewers in 7 African cities (SOFRES survey), is based on the use of the Sabido method, which consists in conveying key and educational messages in a format adapted to the general public, particularly teenagers and young people who have hitherto had little impact on them through traditional awareness raising tools, while taking into account regional specificities. Projects such as ApiAfrique, SunWaterLife or Karethic integrate people into the design process. Alix Nithart, Financial Director of 1001Fontaines, explains that the NGO has already created 600 jobs and provided 500,000 villagers with access to water every day. Indeed, the establishment of a waterkiosk allows the creation of 3 local jobs, and these water entrepreneurs are trained and supported. The main issue for the Tech for Good sector from a medical point of view is access to medical expertise in the case of a serious illness requiring a very high level of expertise. “Deuxième Avis” aims to reduce the inequality of access to this expertise, to do so they have set up digital medical questionnaires where patient information is downloaded and to which a specialized doctor answers remotely in 7 days. This allows the physician to open a complete and structured file, respond more quickly to more patients and not charge the patient any fees. EchOpen (winner of the Lab laboo Prize 2017) works daily on the development of inexpensive and open source medical imaging equipment, connected to a smartphone. An initiative aimed at making this service accessible to all pregnant women, even in medically disadvantaged areas. Digital technology makes this project possible by including artificial intelligence and diagnostic empowerment. Nexleaf designs sensor technologies, generating data analysis and advocating for data-based solutions to global challenges. Health and climate change interventions around the world are hampered by a lack of data. The data allow the following questions to be answered: Does the equipment we are deploying work properly? Does it have the impact it is supposed to have? Are the initiatives undertaken by the global development community really working? Nexleaf has shown how access to meaningful real-time data enables reactive interventions, including monitoring and evaluation, self-correction and accountability mechanisms that have a verifiable impact. For them, robust, resilient and cost-effective technology can bridge the gap where other infrastructure is lacking. In the case of vaccines, if the fridges fail, the vaccines are unusable so developing the Internet of Things (IoT) for the cold chain seemed obvious to Nexleaf in order to have real-time alerts on the condition of the fridges. 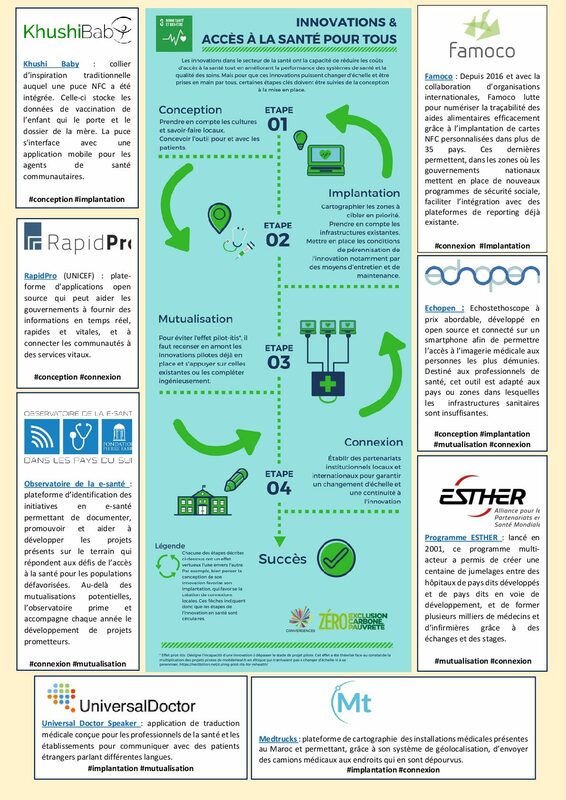 EspeRare adapts the strategies already developed for rare diseases. Indeed, rare diseases affect less than 7 people in 2000 and there is no way to develop treatments “for so few people”, which is why it is necessary to reposition and adapt existing strategies to minimize risks. In 2018, 10 million children were saved thanks to GAVI. In 2000, the creation of GAVI, the vaccine alliance, brought together development stakeholders and the pharmaceutical industries. The partnership model, a public-private partnership, makes it possible to capitalize on the sum of the comparative advantages of their partners and the operating model makes it possible to accelerate access to vaccines and guarantee sustainable financing. Other partnerships in kind can be set up. For example, there is a partnership between Gawad Kalinga and a private telecommunications company. The principle is to exchange NGO databases for corporate infrastructure. Another way to finance the health of tomorrow is to help large companies think about their social impacts, by developing social impact contracts. This is what Koisinvest proposes, which has already raised $15 million to invest in the health system in India. Stanislas Pottier, Director of Responsible Investment at Amundi, invests in the therapeutic innovation sector, respecting the criteria of socially responsible investment, already 270 billion in socially responsible investment. According to him, it is important to use private funds that only pay if it works and to have precise indicators on what has changed. Other solutions make it possible for a model to be sustainable and self-financing such as social enterpreneurship. For example, thanks to 1001Fontaines, the delivery person generates $150/month, which is higher than the minimum income in Cambodia.